The Danubius Arena Hotel in Budapest was an excellent venue for the FCI General Assembly held on May 13-14, 2013. Approximately 60 full members had answered “present” to the invitation plus 7 associated members and 2 contract partners, as all of them wanted to listen to the debates and share their opinions and experiences on the different topics of the agenda. In total, around 135 people + the members of the FCI General Committee met for two intense working days. The President, Hans Müller (CH), opened the meeting on a touching note when he confirmed that after 28 years serving as FCI President, he would not stand for re-election, wishing all the best to the FCI and to his successor. The 2011 and 2012 financial accounts were clearly presented by the FCI Treasurer, G. Jipping (NL), and unanimously approved by the General Assembly. The conference also gave its unanimous approval to the 2014-2015 budgets and different official fees and taxes. FCI President: R. de Santiago (PR) (2-year mandate). Members of the FCI General Committee: G. Jipping (NL), T. Jakkel (HU) and C. Molinari (PT). All were elected for a 4-year mandate. Members of the FCI Standards Commission: J-L. Payró (MX), H. Wiblishauser (DE) and C. Guintard (FR) (4-year mandate). Members of the FCI Scientific Commission: A. Hedhammar (SE), M. Durán (UY) and A. Villalobos (MX) (4-year mandate). Following a vote of the General Assembly, it was decided to dissolve the FCI Legal Commission. Future legal matters will be taken care of by a legal advisor in Belgium. A proposal for a revised working procedure of the Arbitration Commission was also approved. Auditor and his/her substitute: N-E. Ahmansson (SE) and D. Skok (HR) (2-year mandate). A great and emotional moment of the General Assembly was the unanimous and enthusiastic approval given by the General Assembly to the nomination of H. Müller as FCI Honorary President. H. Müller was greeted with an impressive standing ovation from the audience and was decorated with the official FCI Golden Pin. In addition, he was offered different gifts. As required by the Statutes, the reports of the commissions on their activities since the last General Assembly were all studied and commented. Different national kennel clubs had applied for either full or associate membership. 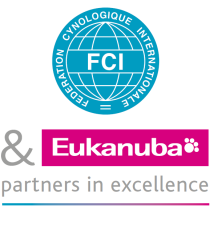 The following clubs were approved to get the status of full members and we sincerely congratulate them: Uniunea Chinologica Din Moldova (UChM), Malaysian Kennel Association (MKA), China Kennel Union (CKU) and Gibraltar Kennel Club (GKC). The Kennel Union of the Republic of Azerbaijan (KURA) was accepted as an associate member and we extend our warm congratulations to them too. A couple of amendments to the FCI Standing Orders and Statutes were approved and it was also decided that the FCI would in the future have its own commission for Flyball. Finally, two important elections were held to determine the countries that would host the future world dog shows and General Assemblies. The 2017 World Dog Show and General Assembly will take place on July 9, in Quito, Ecuador. The 2018 World Dog Show will take place from 9 until 12 August, in Amsterdam, Netherlands.